Please go see this movie. It will be good for you. You will want to talk about it with your friends. 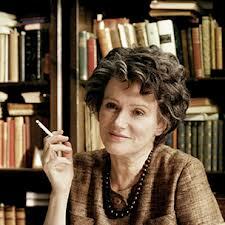 Critics have not been very kind to the movie, Hannah Arendt, because it is a talky movie. I don’t see what else it could be. Hannah Arendt, played in the movie by Barbara Sukowa, was a prominent political philosopher before the New Yorker asked her to cover the trial of Adolf Eichmann in Jerusalem. On the left, here, is Arendt as herself. On the right, Sukowa as Arendt. 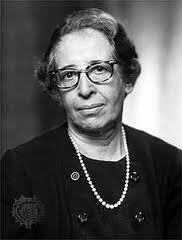 I know Arendt from her Origins of Totalitarianism and The Human Condition. This movie is about Eichmann in Jerusalem: A Report on the Banality of Evil. Most particularly, it is about Arendt’s insistence that the most horrible thing about Eichmann was his mediocrity. Eichmann was not a mon ster, according to Arendt. He was only a paper shuffler. He was not even an anti-Semite. He was a nothing. That is what made the Holocaust so horrible. Have you ever had the experience of trying to point out the “real cause” on an event and being defeated because your explanation didn’t have any villains in it? Or not villains who were quite evil enough? I have had that experience many times. Here’s what happens. Imagine that villainy can be calibrated on a scale of ten. The prevailing sentiment among your audience is that the Villain at Issue—it is Eichmann in this case—should be an 8. Your own view is that, given the circumstances, he is no more villainous than 5. What will you be charged with, do you suppose? Defending the villain! The case you make that he is a 5 is an affront to decent people everywhere and especially to the victims of villainy. You are “defending” the villain by arguing that 5 is a better measure of his villainy than 8! This response is what the movie, Hannah Arendt, is about. We see Arendt in Jerusalem listening to the testimony. 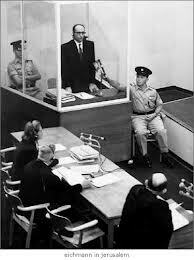 Eichmann is in a class case. They say it is to protect him, and maybe it really was, but he looks in that case, like an exception to the human race. There is everyone else and then there is Eichm ann. Arendt is struck by how horrible the death machine is. Nothing can be said about the Nazi intentions and actions that is too awful to say. On the other hand, once the machine is built, it doesn’t take any particular malice to run it. It just takes bureaucrats who have their orders and who comply with them to the very best of their ability. It is evil, surely. But it is also banal. The OED gives these meanings to banal: commonplace, common, trite, trivial, petty. The operation Eichmann ran was so thoroughly evil it was hard to comprehend. Eichmann’s part in it, Arendt argued, was trivial. It was petty. It was trite. It has always seemed to me that it is more valuable for all of us to understand that social systems can be built that do not require evil men to operate them. Trivial bureaucrats will be enough. This is scarcely saying more than Edmund Burke said: “All that is necessary for the triumph of evil is that good men do nothing.” Arendt, however, pointed to the system. That is what we need to understand. Her opponents wanted to revile Eichmann, himself. In doing this, said Arendt, we cheat ourselves and deny to ourselves a knowledge of what is now possible that we will urgently need in the future. Arendt’s major professor, Martin Heidegger, joined the Nazi party in the hopes of reforming the university system. He was tried, in the denazification hearings following World War II. The French military finally classified him in 1949 as a “Mitläufer or Nazi follower (Mitläufer : person who gives into peer pressure without participation nor resistance nor inner conviction, unlike a fellow traveler, literally “with-runner” similar to “lemming-like”).” I think Arendt’s position was that Eichmann was a Mitläuffer. I’m in no position to say whether Arendt or her critics is nearer to the truth. The better question, it seems to me, is whether we need to understand Arendt’s view of Evil—that’s a capital E—or her critic’s view. Which is more crucially important for us? I’m with Arendt on this one. Mostly. It is also, to a certain extent, about her judgment that the local German rabbis made the Nazi’s work easier by organizing the local Jews for them. Arendt is charged, in this instance, with “blaming the victim” rather than “defending the villain,” but the dynamics work out along the same lines. There is an earlier meaning of banal which has no real historical association with the modern use of the word, but the meaning seems almost an eerie forerunner in Eichmann’s case: “of belonging to compulsory feudal service.”. Thanks to the Wikipedia article “Heidegger and Nazism” for that quote. This entry was posted in Movies, Politics, Uncategorized and tagged Adolf Eichmann, banality, evil, Hannah Arendt, judgment. Bookmark the permalink. Hannah Arendt wasn’t very smart — you can tell from her early philosophical writings and that what ever she really meant, you’d have to be dense to not see the impact it would have. But she truly didn’t understand the difference between banal and cold-blooded. The only reason Eichmann might not be way up on the scale of evil is that he may have not been as high up the ladder as urually described but he was clearly an evil Schreibtischtoeter (desk killer). An interview with his secretary asked her why he did it and she said that her impression was that originally it was simply his duty but with time, he loved it. Hannah Arendt couldn’t see that. I’ll have to disagree about Arendt’s being smart. I hadn’t seen “Schreibtischtoeter” but I grant you it is an apt description of what Eichmann did. My support for Arendt’s position is that the notion of an evil machine is more valuable, more useful, than the notion of an evil man. The Nazis managed a very civilized and diplomatic face to the world when it suited them. A lot of people in this country made the mistake of thinking that they were not capable of unimaginable evil because they didn’t seem “evil” enough. Pointing out the Nazi’s achievement of an evil machine that could make use of perfectly ordinary people was Arend’t gift to the discussion. She is reputed to have had very little empathy and that may be true. But I think she got this one distinction right. Clearly you know a lot more about platforms than I do. I just picked one out of the list they offer and fill in the header with a fresh picture from time to time. Good luck with your quest.